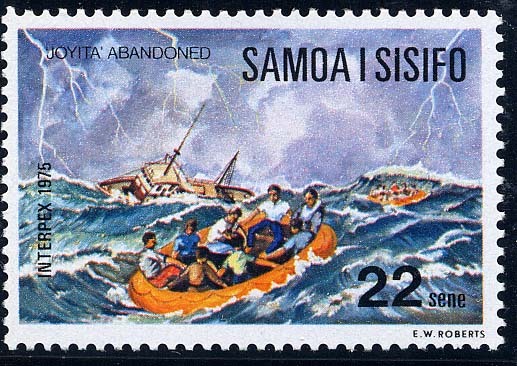 The Western Samoa Post Office released, on March 14 1975, a set of five stamps dealing with the mystery of the Joyita, a 70-ton trading vessel found waterlogged and abandoned after being missing for five weeks after leaving Apia, Western Samoa, on October 3, 1955, for the Tokelan Islands with 16 passengers and a crew of nine aboard. She was not seen again despite an intensive air search by planes of the Royal New Zealand Air Force until sighted by the cargo ship Tuvalu, which was on her way to Fiji for a refit. 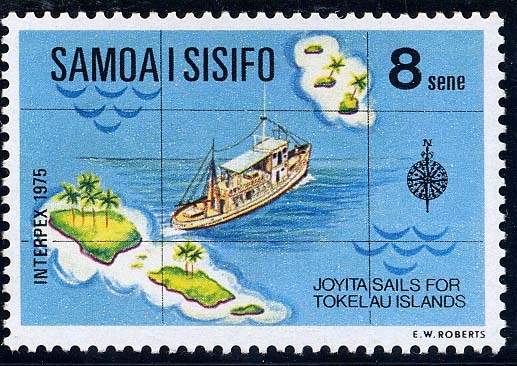 The Tuvalu had only previously steamed once in the area in five years. 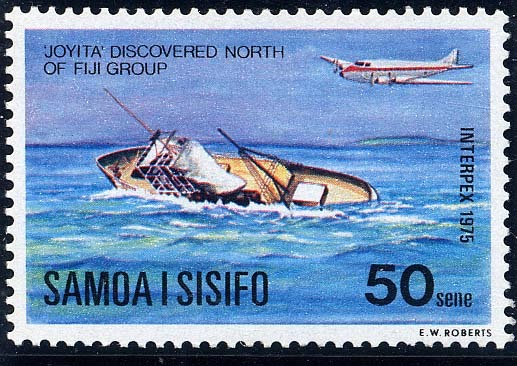 A report from Suva, Fiji, on November 14, 1955, stated that an initial inspection of the ship found drifting, with no sign of life, indicated that she had been in collision. On April 13, 1956, the mystery of the derelict ship was officially cleared up. The official inquiry into the Joyita mystery was held at Wellington, New Zealand, and a simple explanation was given. The inquiry commission tabled its report in the New Zealand House of Representatives and said the disaster was due to flooding, caused chiefly by corrosion and breaking of a small pipe in the cooling system of the port auxiliary engine. The report found that failure of radio equipment and lack of a properly equipped lifeboat were also causes of casualties to the nine passengers and 16 crew headed by Capt. Thomas "Dusty" Miller, formerly of Cardiff. The Commissioners said that the ship was exceptionally seaworthy in hull design but was unsuitable for the carriage of passengers. Within nine months however the Joyita was in trouble again. 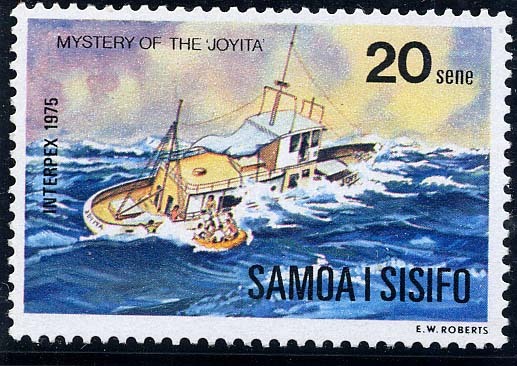 A report from Suva on January 8,1957, reads: 'The 70-ton Joyita is in trouble again, and is now a wreck on Horseshoe Reef in the middle Fiji group, where she went aground. The passengers, including women and children, and crew are safe. The 434-ton Australian vessel Yanawai has taken off eight passengers, and the crew was standing by aboard and in boats. SG444-48. Launched as the JOYITA which is a Mexican word meaning “little jewel”. Mr. West wife name was Jewel Carmen. Tonnage 70 ton gross, 47 ton net, dim. 69 x 17 x 7.6ft. (draught). Her hull was made of two inch cedar planking on oak frames. Twin Atlas diesel engines, each 120 hp., twin screws. bunker capacity was 3,000 gallons. 1941 Requisitioned by the USS navy at and thereafter used as a district patrol boat YP-108 by the 14th Naval District at Hawaii. After World War II out of service and placed on the disposal list. 1948 Sold to the firm of Louis Brothers. 1950 Sold to William Tavares. 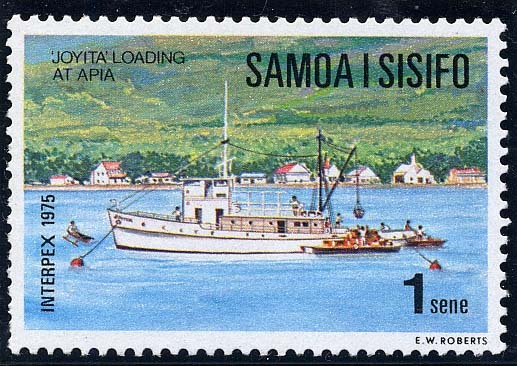 1952 Sold to Professor Dr. Katharine Luomala of the University of Hawaii, the fiancée of Captain Thomas H. Dusty who chartered the JOYITA from Luomala for use as a cargo and fishing boat.